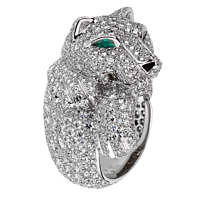 A magnificent Cartier Panthere ring featuring the finest Cartier round brilliant cut pave diamonds. The eyes are set with 2 pear shaped emeralds and finished with a onyx set nose. 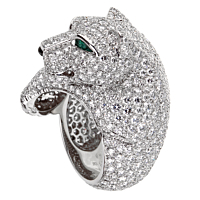 This Panthere by Cartier rests his head on his paws and looks out at the world through emerald eyes.